I’m concerned enough that I’m calling for help. Dr. M posted her concerns earlier today. There are now several Burgeron family members that are missing: JJ Mac GIF, Stefanie, Bella & Bonnie Burgeron , and Julie Burgeron. Quite possibly West Burgeron too – although I’m not positive if he was coming or not. There was even a mention quite early on that the Headless Inkspots from over in DS106 City would be sharing their music at the trailer this summer. Everyone made contact early on that they would be joining us, started their journey, then not a word. 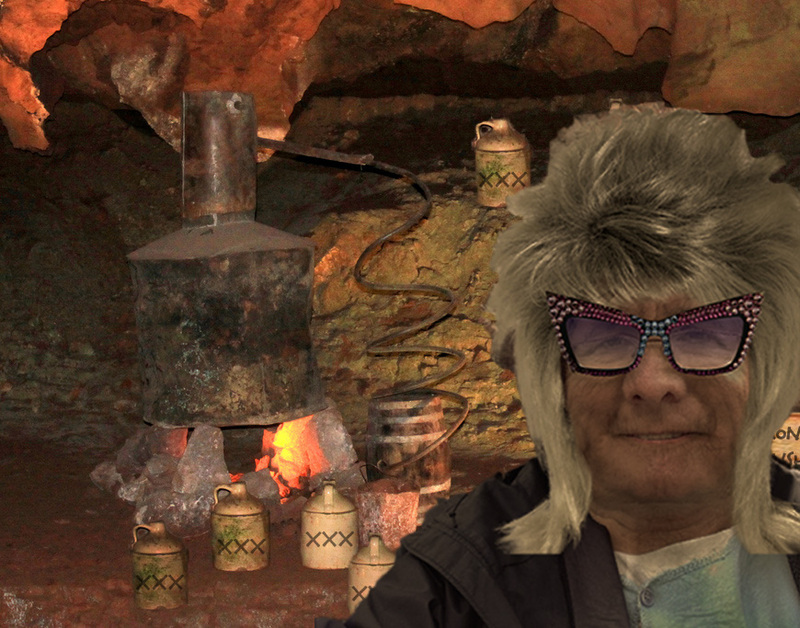 Our Bovine County ace reporter Betsy de R. and Aunty Sappy were investigating some strange sounds over the 4th of July, possibly linked to that mysterious AREA 106, but they haven’t located any of our missing family members. 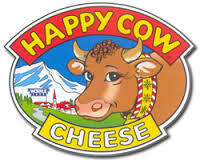 Thank goodness we know Anna Cow is just fine. 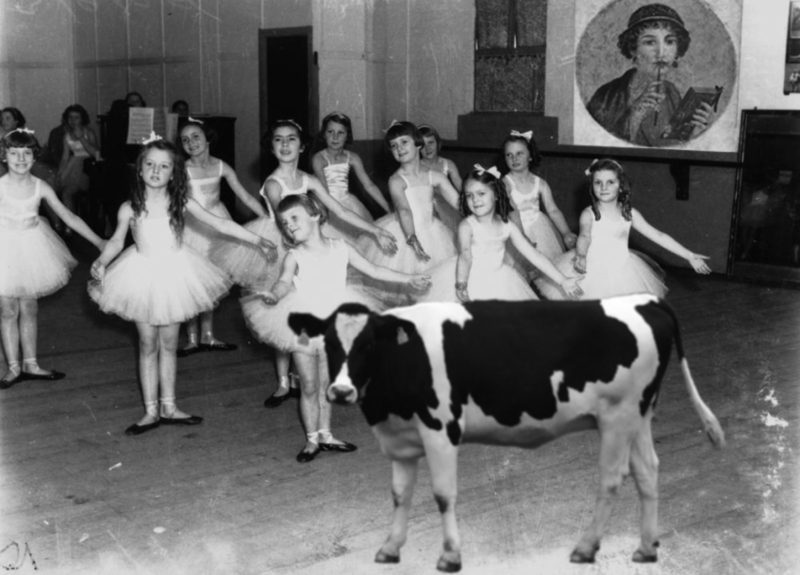 Congratulations dear on be crowned “Miss Bovine America” at the Bovine County fair. While Mama and Little Boo are doing some traveling over in Italy at the moment, they’ve at least kept in touch to let me know they’ll be back home in plenty of time to help with the preparations for the big family reunion. Now with all these missing family members, I personally took it upon myself to head over to the Bovine County seat in DS106 City last night to flash the Bovine Signal, hoping to summon our local caped crusaders to aid us in finding our lost family members. Could they have been abducted? Or have they been sucked into a time vortex like Highlander Don? Or met some other sinister demise? 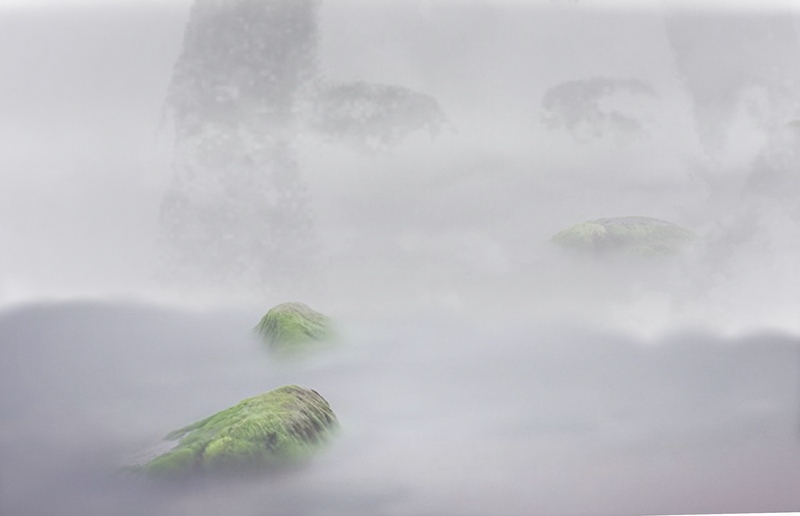 Maybe they’re just lost and their cell phone service doesn’t reach out here. Whatever it is, I want to get to the bottom of this. I’m turning 100 for landsakes. This is a big event for the family. No evil do-er is going to ruin my party. 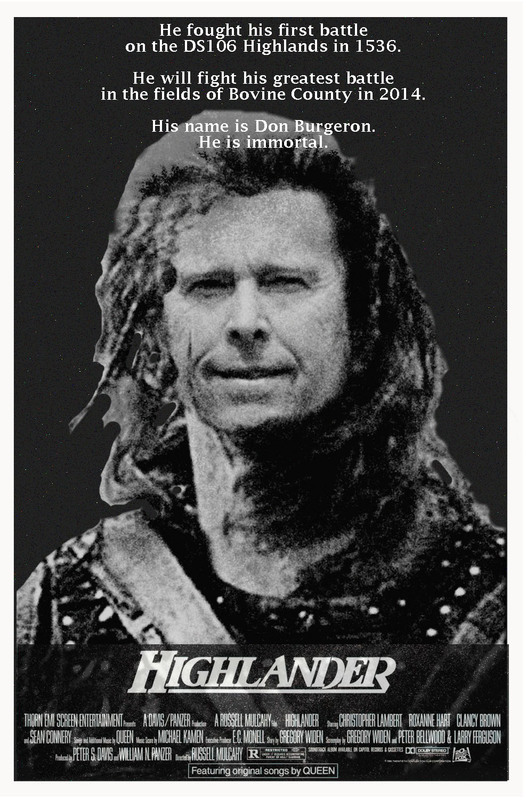 The Family was having so much fun this week riffing on movie posters that I decided this ol’ gal would have to take a go at it. Even Dr. M got in the act by creating a new DS106 Assignment: The Best Bond is a Dog. 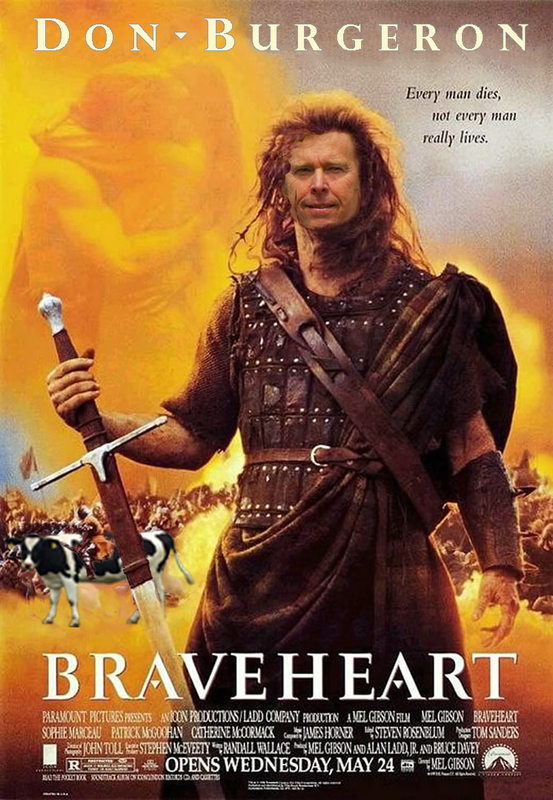 With the flick of my Photoshop magic wand, cloning tool, and healing brush Don Burgeron is now starring in the hit film Braveheart with his trusty bovine battalion at his side- Anna Cow in the lead. But that’s not all, as I was doing my research on the poster and movie I came across something very interesting. That buzzing sound Don Burgeron heard last week before he went missing? It was quite possibly a time warp forming to pull him back into the 16th century where he first became a Highlander fighting bravely for the Burgeron106 clan back in the DS106 Highlands in 1536. There is a rumor going around that Don is seriously being consider for the starring role in the new Highlander remake that was to start filming in 2014 when lead actor Ryan Reynolds exited the movie last summer. 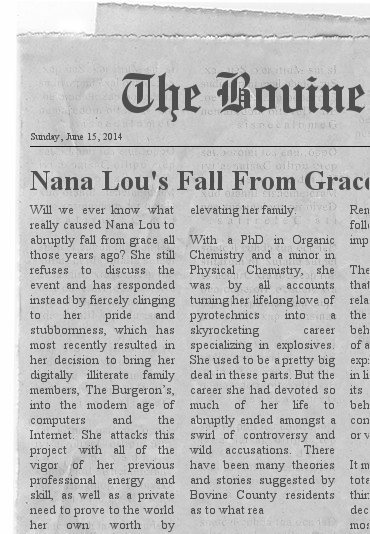 Nana Lou’s Fall From Grace is reposted from DS106 Daily Create TDC889 “Rumors of Bovine County”. Well, it’s coming up yet again. Can’t this little blemish in my past ever go away? 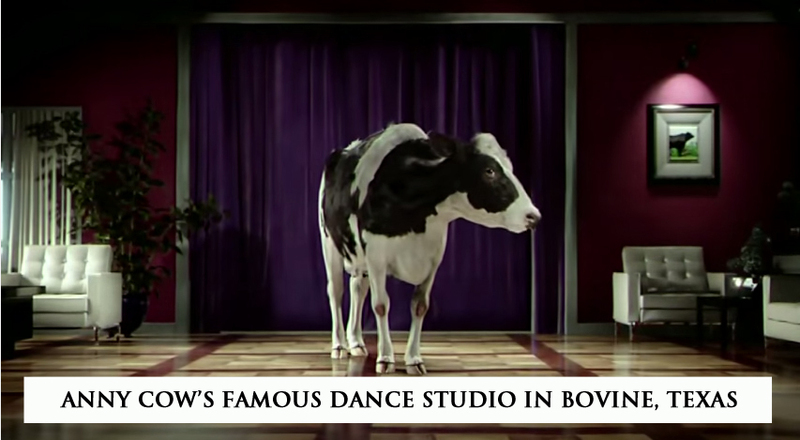 I’ve remained silent all these years, but Bovine County just won’t let it go. 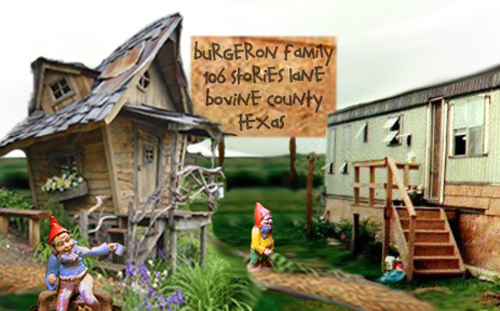 Maybe I will finally have to give in and share the whole story at the #burgeron106 family reunion gathering for my 100th birthday. What other surprises might be in store for those folks who decide to stick around this summer. Tell a story that is whispered in Bovine County. Make it ART. Miss Cris Crissman / @Cris2B Twitter shared this little ditty. My Grandson Don was able to snap the pic above this morning. I’m betting that happy gnome on the log in front of my place is drinking some of that Burgeron Backwoods Brew we made a few weeks back. If Don keeps sharing it with the cows and now the Gnomes, we’re not going to have any left for the reunion party at the end of August. There was something unusual about the garden gnome stationed near the peonies at the Burgeron family home. His eyes seemed to follow you around like those of a bad ancestral portrait. And that look on his face, well, could it be disgust? I’m definitely posting his pix on Instagram. Whoa! How’d I trip? That was quite a wallop. If I didn’t know better I’d say that funky little fat creature didn’t like having his picture made . . .
And that’s how the rumors of the grumpy gnome at the Burgeron’s place began. Well, folks. It’s Nana Lou here, reporting for duty. Some of you may have noticed I’ve been MIA lately. The truth of it is I’ve been holed up in a tumble-down shack in the middle of a God-forsaken forest at the plum exact center of nowhere. Yes, the birds are a-singing, the flowers are a-blooming and the lovers are pairing off to stumble down the aisle into wedded bliss. That means pre-parties and after-parties and all manner of debauchery so the orders for a little backwoods refreshment are comin’ in strong with my grandson Don and his fool-headed cousin Clitus, Comet’s boy, tripping over themselves to oblige. 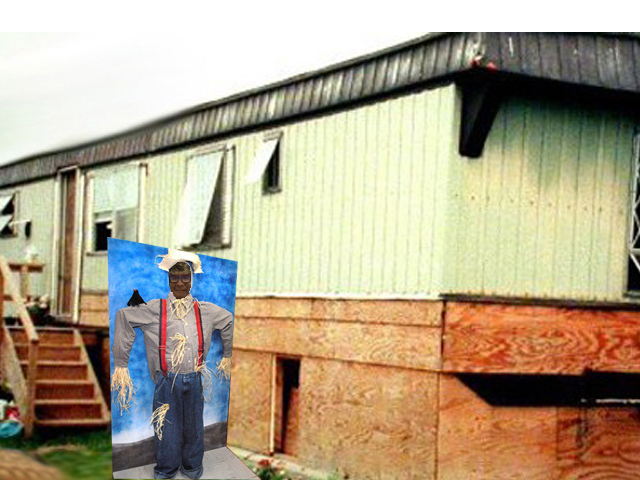 All I can say it’s a good thing Clitus’s brother Ron stayed home waiting for his newly discovered son Reggy to arrive. Land sakes, I don’t know how I could’ve handled all three of ’em. I will never understand how those three emerged like they did from the loins of our great lineage. They’ve got the brains (of course) but no common sense. It’s the 21st century, for heaven’s sake. 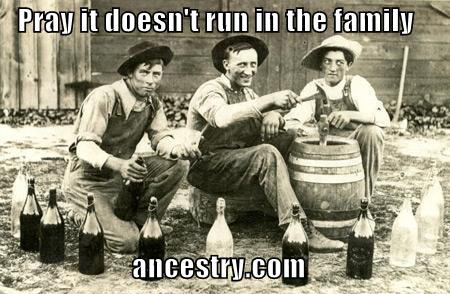 Anyone can run down to the Bovine County corner liquor store for half the cost and none of the risk. But Don and Clitus fancy themselves in 1920’s pinstripes and bowlers so of course I went along to keep an eye on things. And didn’t sleep a wink! I do believe those boys wouldn’t know a condensing coil from Tigger’s tail. I was hobbling every which way just keep them from blowing something up. After that big blow-out a few years back when they were showing off for that hunky Jean-Claude Van Damme, these boys need lookin’ after. Still, it did remind me of a more adventurous period of my own youth when the excitement of explosive chemistry had not yet been tempered by army discipline. Well, the good news is that everyone made it back alive this year and the only casualties were a few eyebrows and some future taste buds. Of course the garden was a disaster when I got back, completely over-run with weeds, and the mosquitoes had conveniently bloomed into full blood-sucking harvest. But the boys did finally show some proper respect for their elders and fixed it up quite nicely while I took a well-deserved nap. They even called Gretta, Don’s ex-wife, over to make up a fine dinner and let the grand kids, Bella & Bonnie, fuss happily over their great great grandma. So all-in-all it was a rather fine adventure but kept me off-base for several days. I might have to stay home next year. I don’t suppose I’ll be quite as spry at 100. Nana Lou, signing off. Special acknowledgement to Nana Lou’s ghost writer, Amber Lockridge, for this inspiring post.